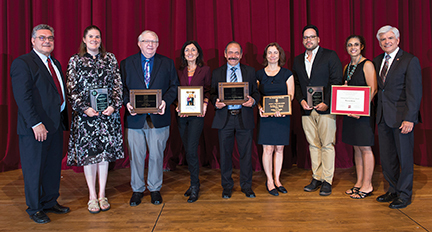 New Mexico State University honored its faculty and staff at the 2018 Fall Convocation ceremony in August. Every fall and spring, convocation is held to celebrate the start of a new semester. Catherine Brewer, Department of Chemical and Materials Engineering, and Ernesto Moralez, Department of Public Health Sciences, received the Patricia Christmore Faculty Teaching Award. Jaime Ramirez-Angulo, Klipsch School of Electrical and Computer Engineering, and John Shonk, Center for Academic Advising and Student Support, received the Excellence in Academic Advising Award. Kathryn A. Hanley, Department of Biology, received the Westhafer Award for Excellence in Research and Creative Activity. Teresa Dean, College of Agricultural, Consumer and Environmental Sciences Extension agent in Doña Ana County, received the Distinguished Extension Award for her outstanding leadership and unwavering dedication to Extension. Regents Professor Elba Serrano was honored for receiving the national Presidential Award for Excellence in Science, Mathematics and Engineering Mentoring.